After another busy season of hand weeding, irrigating and a lot of crop management, we turn our attention to the carrot harvest of 2017. This keeps the team very busy. It’s always so rewarding to see the crop being lifted and looking so good after all our efforts of the season. 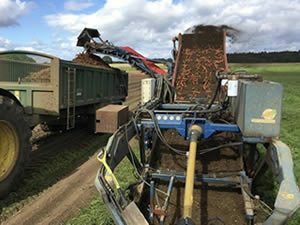 Unlike onions and potatoes, which are harvested in one go, our carrots are harvested from September through to January/February.